Coming to an IMAX Theater Near You! Who will build the amazing future of our human race? That question sparks a giant-screen adventure unlike any other in DREAM BIG: Engineering Our World, an epically fun tour of inspiration through the visionary advances made by yesterday’s, today’s – and most thrillingly of all, tomorrow’s – engineers. 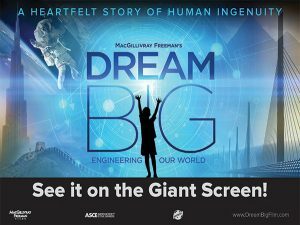 On Friday, Feb. 17, 2017, the first ever IMAX® movie answering the call of the STEM (Science, Technology, Engineering, Math) initiative, DREAM BIG: Engineering Our World, will premiere in IMAX® and giant-screen theatres across the world. DREAM BIG: Engineering Our World produced by MacGillivray Freeman Films, in partnership with the American Society of Civil Engineers, and presented by Bechtel Corp., offers a fresh perspective on engineering and aims to inspire kids with diverse backgrounds to become innovators, educators, and leaders who will improve the lives of people across our entire planet throughout the 21st century. On Monday, Feb. 20, 2017, please join the Tallahassee American Society of Civil Engineers, FAMU-FSU College of Engineering, the Florida Board of Professional Engineers, the Florida Engineering Society, and the Challenger Learning Center in an evening of fundraising to inspire local K-12 students to DREAM BIG and explore the world of engineering. The night includes a networking hour complete with hors d’ourves and cash bar and a private viewing of MacGillvray Freeman’s DREAM BIG: Engineering Our World IMAX® movie. Tickets are $15 for adults and $5 for children under 12. All proceeds from the evening will support local K-12 engineering outreach. For more information about DREAM BIG: Engineering Our World; view video excerpts from the movie; learn about the projects and locations where the movie was filmed; access educator resources and student activities go to the website at http://www.dreambigfilm.com/. To view the listing of local theatres in your area showcasing the DREAM BIG: Engineering Our World film, go to http://www.dreambigfilm.com/theatres/.